Wilson V. Eagleson Jr. was born into one of the most historic families of IU history. His great grandfather, Halston Vashon Eagleson, was born a slave and moved to Bloomington in the 1880s. Five of his six children attended Indiana University. His son Preston was IU’s first African American intercollegiate athlete. Preston’s son, Wilson Vashon Eagleson Sr. was one of the first African Americans enrolled in the IU Reserve Officer Training Corps program in 1916, and one of the first African American officers in the U.S. Army. Wilson Sr. married Francis Marshall, the first African American woman to graduate from IU. When Wilson Vashon Eagleson Jr. entered IU in 1940, he had big shoes to fill and an IU legacy. 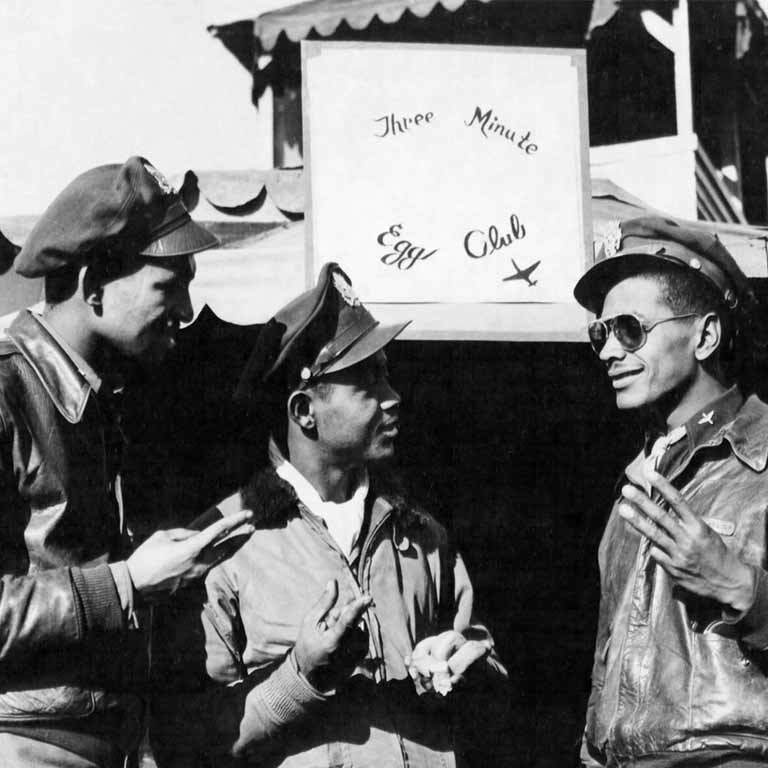 However, the sound of the war drums quickly drew him away from IU and into a unit that would later be known simply as the Tuskegee Airmen. Eagleson became a pilot with the 99th Fighter Squadron. He was credited with two aerial victories and was twice injured, once while bailing out of his damaged aircraft. After the war, Eagleson left the military but after two years, he joined again to serve as a flight mechanic. He went on to serve in both Korea and Vietnam and retired after a 30-year career in the U.S. Air Force. Once, Eagleson was a passenger on a military cargo plane that was hit by anti-aircraft fire and both pilots were severely injured. Eagleson took over flying the plane and managed to land it safely. He was awarded the Distinguished Flying Cross for his actions. The Goldsboro North Carolina Chapter of the Tuskegee Airmen is named after him.